Good News Bible Chapel in Attleboro was launched in 1935 by Arthur and Ceinwyn Stebbings, Eugene and Hilda Quarnstrom, and Walter and Florence Jacobsen. In the early 1930s, the Stebbings were living in Pawtucket, RI and were in fellowship at Pawtucket Gospel Hall, an assembly with it’s background in the Open Plymouth Brethren movement. Mr. Stebbings had a small printing business in Attleboro. Through his business, he came to know the Quarnstroms and Jacobsens who were Attleboro residents. The three couples began meeting together in their homes to study the Scriptures. Good News has moved around a few times. From 1938 to 1950, they rented space in the Oddfellows Building on Bank Street and took the name Christian Assembly of Attleboro. From 1950 to 1954, they met in a converted garage at 32 Major Street, and there took the name Good News Chapel. In 1954, the assembly purchased an historic schoolhouse building at 138 South Main Street and remained there until 1976. 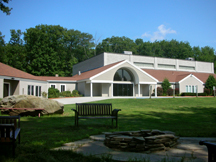 The current land was purchased in 1977 and the original chapel wing of the current facility was built. Among those active in leadership early on were Albert and Rhea Johnson, Elmer Pierce, James Ruddell and Ken Brasier. 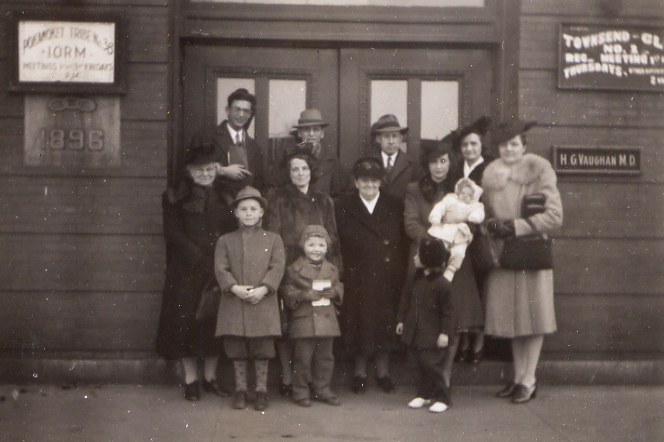 The second generation of leaders included Alden and Fern Stebbings and Bob and Beatrice “Bunny” Holmes. A third generation included Tim Stebbings, Steven Todaro, Ebben Finnermore, Shelton Forrest and Steve DuPlessie. Over the years, Good News continued to be focused on evangelism and teaching the Bible. Arthur and others at Good News had an active ministry in area prisons. Good News founded and hosted Attleboro Christian Academy – a K-12 grade school – from 1979 to 1993, and New England Center for Biblical Studies – an evening Bible school for adults directed by Bible teacher Phil Goodwin that closed in 1980. In 1993 Rick Simmons, a recent Western Seminary grad, was invited to work with the elders to expand the outreach effort. God blessed in many simple and dramatic ways. Following a building fire in November of 1994 that put us in a local elementary school for a year, the building was remodeled and expanded to include new classroom space and the Activity Center. To accommodate the steady growth, the elders decided to move the services from the original Auditorium into the Activity Center. After 9 years of strong leadership Rick moved on to other ministry opportunities. In 2004 the elder team of Alden Stebbings, Mark Wurster, Bill Silva, Matt Harris, Steve English, Rob Harkins, Steve DuPlessie and Dave Stebbings asked Ben Parker, a Gordon College Youth Ministries grad and experienced youth pastor, to serve full time as the Director of Youth Ministries at Good News. In 2005, they asked fellow elder Steve DuPlessie to leave his position in the marketplace and serve full time as the Teaching Pastor. A member of Good News since the mid 1970s, Steve combines marketplace experience with his gifts in pulpit teaching and pastoral care. In 2005 a group of believers from Kenya began using our building to plant a church in Attleboro. It was great to partner with them as they worshiped in Swahili and we worshiped in English. After sharing our campus for three years they bought buildings downtown and moved in as St. James African Anglican Community Church! Then in 2012 a group of Latino sisters and brothers began using our building with the expectation of buying their own building as their new church plant grew. God had other plans. In the summer of 2014 that Latino group merged with GNBC family, becoming the “GNBC en Espanol” Spanish language ministry of the Chapel, currently led by Freddy Perez, ThD. In 2015 Ray Anchan, MD, PhD and Ben Parker were added to the elder team of Mark Wurster, Dave Stebbings and Steve DuPlessie. Today the mission of Good News is still the same – “Leading people to faith and maturity in Christ.” The plan is two-fold: “Leading people to faith” through deliberate evangelism through personal relationships and community services – such as the weekly “City Supper” soup kitchen, rescue mission and nursing home outreaches, and the monthly free clothing distribution ministries – and “Leading people to maturity” through both targeted Sunday services that combine joyful praise and worship with preaching that aims at life change from God’s word to equip Christians for growth to spiritual maturity, and a church-wide culture of mid-week home small groups that we call Care Groups for Bible study, prayer and developing relationships for care and accountability.